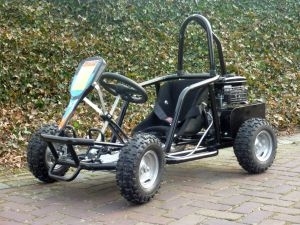 The Road Rat 90cc is a little buggy or kart, especially for young children. Despite its low speed, your child will enjoy driving with this buggy or kart. He/she will find it a real speed demon! The Road Rat 90cc is the first step to other motorized vehicles. In a 'large' garden the Road Rat 90cc feels at home. In this way, the Road Rat 90cc show what its capabilities are. The NBluck 110cc is suitable for older children, with an average speed of 40 km/h you can enjoy racing around on your own site. Dreams come true!